2012 was the UK’s second wettest year since records began over a century ago. It was actually England’s wettest but less rain in Wales, Scotland and Northern Ireland meant the UK average marginally missed top spot. After a bright start to the year, the deluge began in April and never stopped. Flooding caused chaos throughout the summer months. As an artificial grass company – one of our main USPs is that a fake lawn can save you money on the cost of watering. In the last 5 years, due to the UK’s changing weather patterns, this selling factor has become laughable. Consumers are now more interested in drainage. One thing your garden needs in a country with increasing rainfall and frequent floods, is adequate drainage. Did you know that artificial grass can be beneficial if you have drainage problems? Fake lawns provide enhanced drainage; rain water will disappear faster, preventing waterlogging. As standard, our artificial lawns are installed on top of a base of crushed hard-core. The grass carpet has millions of tiny holes so water runs through freely. If you have a problem with drainage whereby pools collect on parts of your lawn, we can even install a suitable solution when we excavate. Artificial grass also means your garden will be free from mud. You won’t get muddy foot prints on the kitchen tiles, or worse – your cream lounge carpet. This means kids (and pets) can enjoy the garden this summer without the hassle, whether it’s been raining or not. Swiss team FC Gspon have the highest football stadium in Europe. At 2,000m (6,560ft) above sea level, it’s so high that grass won’t grow so they had to opt for an artificial pitch. 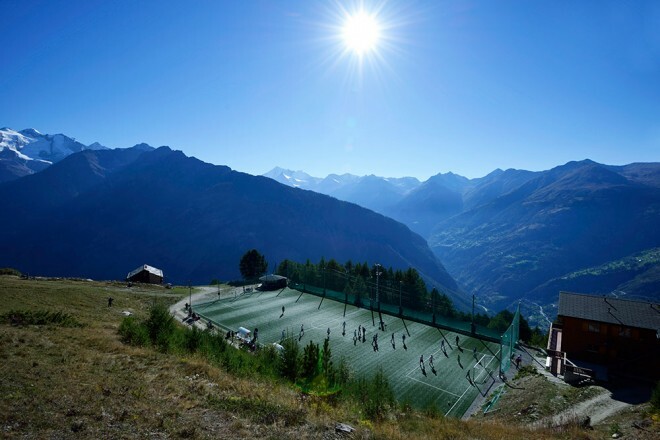 Ottmar Hitzfeld stadium is located high in the Swiss Alps, near the resort of Zermatt. There are no roads so players and supporters take the cable car up the mountain from a nearby village. While access may be poor, the upside is that the views are specular. The high altitude pitch is yet another amazing application for fake grass. As altitude increases, the climate changes and the air becomes colder and drier. These conditions are unsuitable for growing natural grass. The grass cannot take root sufficiently so would not be strong enough to cope with play. The only solution: an artificial pitch that can withstand any climate. It is a common problem in Colorado; citizens grow hardier, hybrid grass species and seed at certain times of the year. This wouldn’t be an option for a professional football facility. Readers may remember the controversy in 2007 where Bolivia, Ecuador and Colombia were banned from hosting world-cup qualifiers as an altitude of 2,500m gave acclimatised players an unfair advantage. After much protesting, FIFA were forced to back down. Bolivia’s Estadio Hernando Siles is the highest in the World at 3,577m above sea level. The highest in the UK is The Hawthorns at 552ft – West Bromwich Albion also play on an artificial grass pitch.